This newer NSAID is a relatively weak inhibitor of PG synthesis and there is some evidence to indicate relative COX-2 selectivity. Anti-inflammatory action may be exerted by other mechanisms as well, eg. Reduced generation of superoxide by neutrophils, inhibition of PAF synthesis and TNFα release, free radical scavanging, inhibition of metalloproteinase activity in cartilage. The analgesic, antipyretic and anti-inflammatory activity of nimesulide has been rated comparable to other NSAIDs. It has been used primarily for short lasting painful inflammatory conditions like sports injuries, sinusitis and other ear-nose-throat disorders, dental surgery, bursitis, low backache, dysmenorrhoea, postoperative pain, osteoarthritis and for fever. PARACETAMOL – Paracetomal has negligible anti-inflammatory action. It is a poor inhibitor of PG synthesis in peripheral tissues, but more active on COX in brain. One explanation offered for the discripancy between its analgesic-antipyretic and anti-inflammatory actions is its poor ability to inhibit COX in the presence of peroxides which are generated at sites of inflammation but are not present in brain. In contrast to aspirin, paracetamol does not stimulate respiration or affect acid-base balance, does not increase cellular metabolism. It has no effects on CVS. Gastric irritation is insignificant-mucosal erosion and bleeding occur rarely only in overdose. NOM-P does not affect platelet function or clotting factors and is not uricosuric. In isolated antipyretic doses NOM-P is safe and well tolerated. Nausea and rashes occur occasionally, leucopenia is rare. Adverse effects of NOM-P are gastrointestinal (epigastralgia, heart burn, nausea, loose motions), dermatological (rash, pruritus) and central (somnolence, dizziness). IN NOM-P For a variety of conditions requiring anti-inflammatory, analgesic, antipyretic activities, e.g. osteoarthritis, extra-articular rheumatic diseases, pain and inflammation after operative intervention and following acute trauma, relief of fever and pain associated with acute respiratory tract inflammation and dysmenorrhea. Oral dosage form in adults :100 mg b.i.d In children : 5 mg/kg/day in 2 or 3 divided doses. 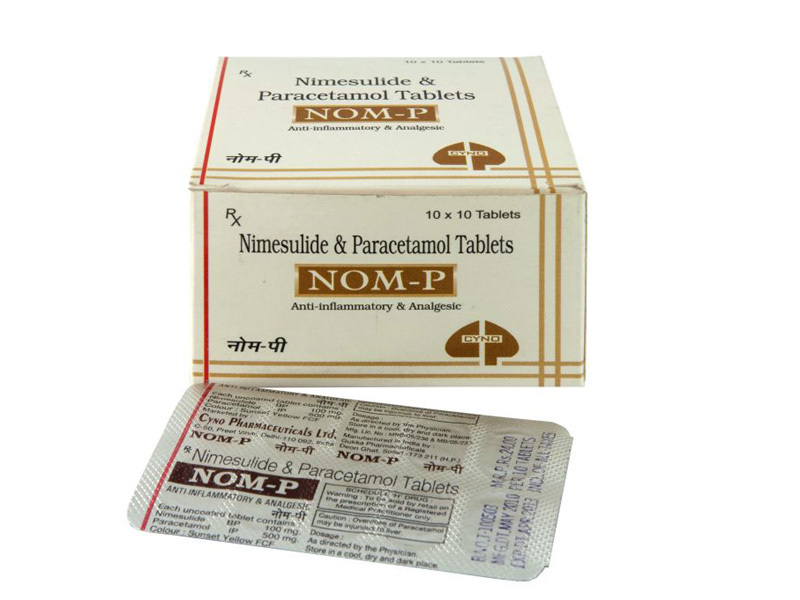 NOM-P is contraindicated in hypersensitivity, active peptic ulcer, moderate to severe hepatic disease and in pregnancy. can be given- no risks are known in connection with therapeutic doses. Allowed in therapeutic doses for women who are breast-feeding, only small concentrations in breast milk. 10-12 mg / kg every 4 to 6 hrs. Those with Alcohol abuse, Colitis, Crohn’s disease, diverticulitis, gastric ulcer, Diabetes mellitus, Hemorrhoids, Hepatitis, renal disease, rectal irritation or bleeding, Systemic lupus erythematosus and Tobacco abuse may have increased chance of adverse effects. When NOM-P is taken along with Cyclosporine, Digitalis glycosides, Lithium, Methotrexate, Phenytoin there will be elevated serum levels of these drugs and an increased chance of adverse effects.